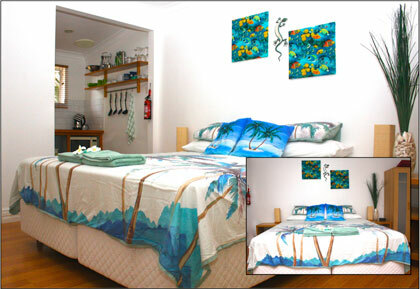 All Cocos Seaview suites are fully air conditioned and have quality furnishings and accessories throughout. 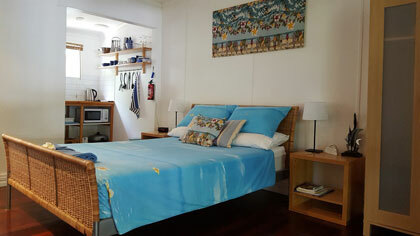 Each suite has a comfortable bed with fresh, clean linen and bath/beach towels. A colour TV with inbuilt DVD plus a clock radio are standard features of the suites. 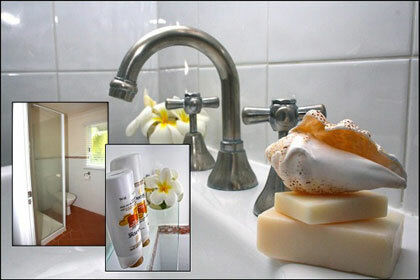 Each suite has a private ensuite bathroom. Each suite also has a fully equipped kitchenette, with quality appliances including fridge, freezer, kettle, toaster, microwave, electric frypan and egg cooker. All cutlery and crockery is provided and all suites have their own picnic set with plates, cups, cutlery, etc. Each suite overlooks the central tropical garden and has their own wooden deck area with furniture and overhead fans. Insect screens are fitted on all windows and doors. We also have a newly renovated, covered outdoor entertainment area in the garden for our guests use. 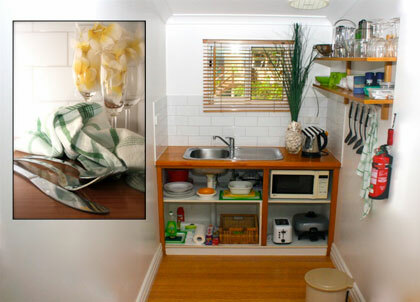 This area includes a bar fridge, electric BBQ, rice cooker and wok. There is a dining table and chairs as well as comfortable lounges. One room has a king-size bed which can be reconfigured into two single beds for twin-share (direct booking only). Please contact us for more information and bookings. The other rooms have a queen size bed. Located on West Island in a quiet leafy cul-de-sac just 700 metres from the centre of town Cocos Seaview is secluded, romantic and intimate. Tucked away among the tropical palms and trees in the residential area Cocos Seaview offers a relaxed experience away from the town centre. Cocos Seaview is just a one minute walk to the Indian Ocean. The town centre, with shops, restaurant, Cocos Club bar and other island facilities is an easy ten minute stroll along the seafront. The community bus stop is a short stroll if you wish to catch the ferry across to Home Island or Direction Island. Our rooms are designed to accommodate a maximum of 2 adult guests. Please note that Cocos Seaview does not cater for children. 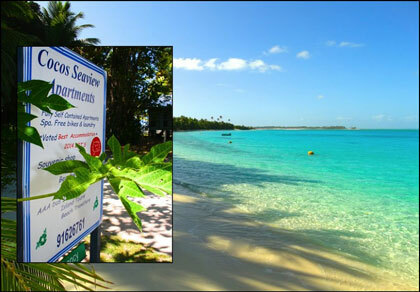 Cocos Seaview has dedicated owner/managers who live on-site to provide a friendly and relaxed service for all guests. You will be met at the airport terminal and delivered to your suite. You will also be returned to the airport on your return home. Once at Cocos Seaview you can choose to be left alone during your stay or ask us any questions you may have about things to do and see during your stay. All suites have up-to-date compendiums regarding Island life. We provide a free Island tour on your arrival to enable you to work out what, where and how to get the most out of your time on Cocos. All tours can be booked once on Island. We suggest you book in advance for your car hire as the number of cars on the island is limited. 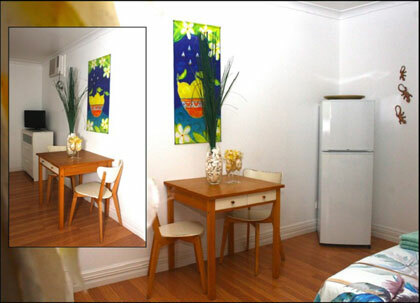 Your room is serviced weekly and access to a fully equipped laundry is also provided free of charge. Cocos Seaview offers, by arrangement, late checkout for guests. Rooms are non-smoking. Limited wireless internet access is available in all rooms and outdoor facilities for a modest fee. 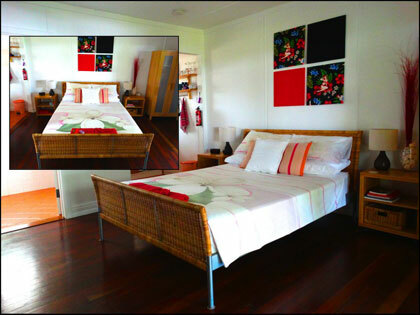 Our rates are from $240AUD per night. In order to do the island and your holiday justice, our minimum stay is 7 nights. We accept payment by direct deposit (EFT) or credit card.